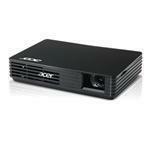 The ultra-light LED Pico Projector Acer C120 fits comfortably into any pocket. View videos, photos and business presentations on location in various formats, which you can rely on a long battery life. C120 Pico Projector easily enables mobile presentations with high image quality. 180.0 g (6.35 ounces) Approx.